Yes, I said things because she doesn’t only make awesome cards. She makes keychains, notebooks, tote bags, magnets, and clothing. YES! 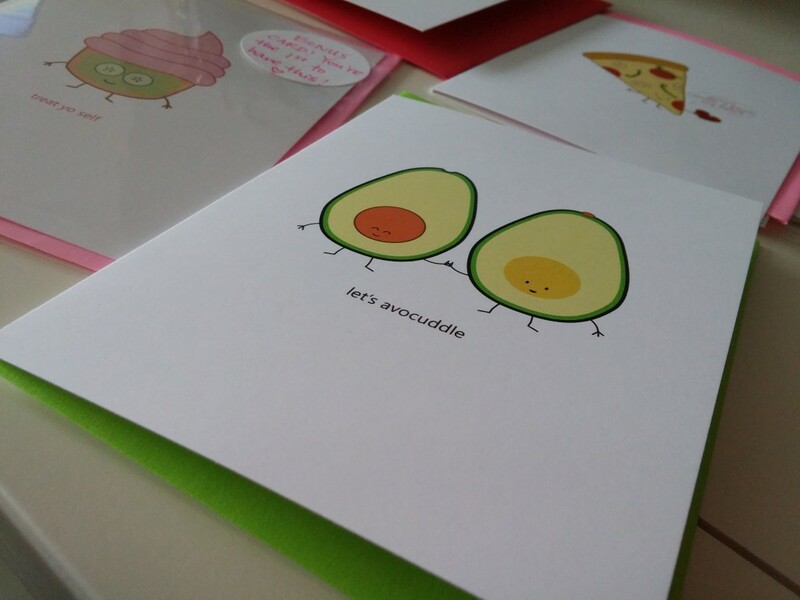 You can get this Avocuddle design on a shirt. Who can now live without this design on their bod? Not me. But I digress, one of the main reasons I absolutely adore Queenie’s Cards is that these designs are handmade. These quality products are created by an artist. A person! This is her business. Her creations! I cannot stress how absolutely important it is to support handmade products. In particular, products in which the creators take so much pride in. And to top it all off, Queenie is one of the sweetest creators I have had the pleasure to order from. She is quick to answer any questions you may have on any of her products. You can even work with her to create a custom design! If you’re like me and have absolutely no drawing skills but an overactive imagination this is a dream. Lastly, because I know this is friggin’ important when it comes to ordering online, the shipping was incredibly fast. I live in Texas and considering these packages came from Canada in about a week with us having two snow days is incredible. I should add that snow days aren’t common in Texas. We seriously close everything down. I discovered Queenie’s Cards through a Facebook giveaway I had the incredibly luck of winning. I did, however, also purchase from her shop because I couldn’t stay away. I mean, she keeps coming up with these cute punny designs that kill me. My cuteness desire knows no bounds. I need it all. You bet I’m already plotting my next order. I have a few birthdays coming up in which some of my friends will have the pleasure of receiving at least one of her cards. How awesome is that Treat Yo self one? AND I was the first person to get this design! You can definitely assume I geeked out. 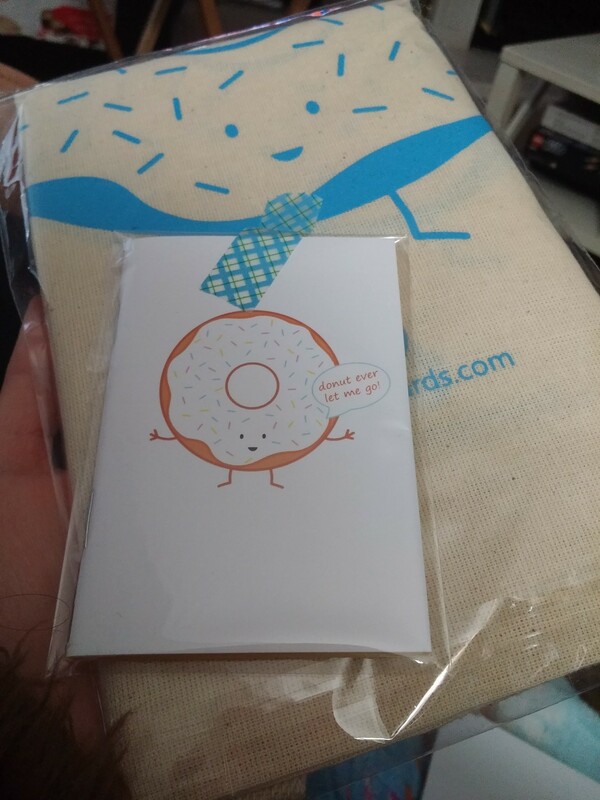 Could you get a donut tote and not not get a matching notebook? No. You cannot. Who has that kind of self-control? Robots, maybe. 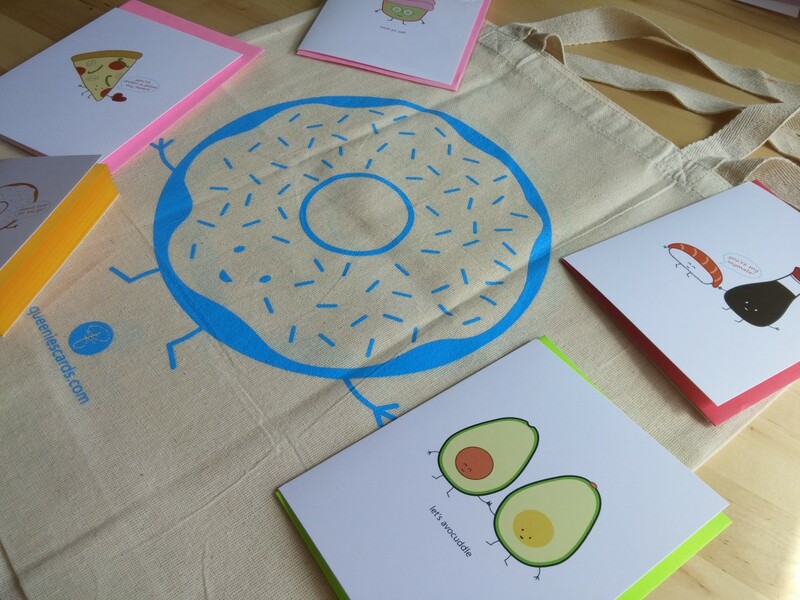 Not I.
Donut tote hanging out with Donut notebook. They’re homies. They go together like shamalamalama blah blah blah boo di pop. 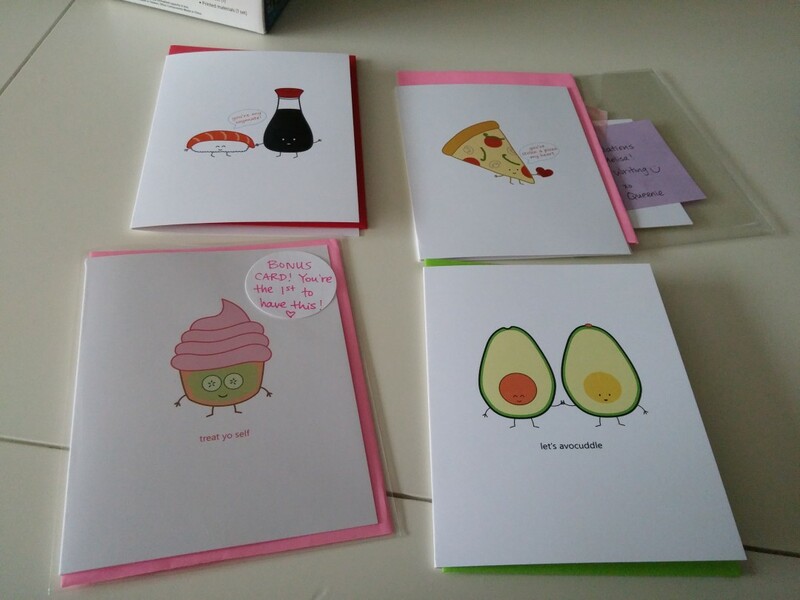 You can find, follow, and salivate over Queenie’s Cards on Facebook, Etsy, and Instagram. Aaaaw thank you so much, Queenie! It’s written surrounded by your creations which I love entirely. Please keep doing what you love because I definitely will keep buying. You have to read this sweetest most funnest review about queenie’s cards! Warm Toasty Muffins is our new favourite Taexn blog!